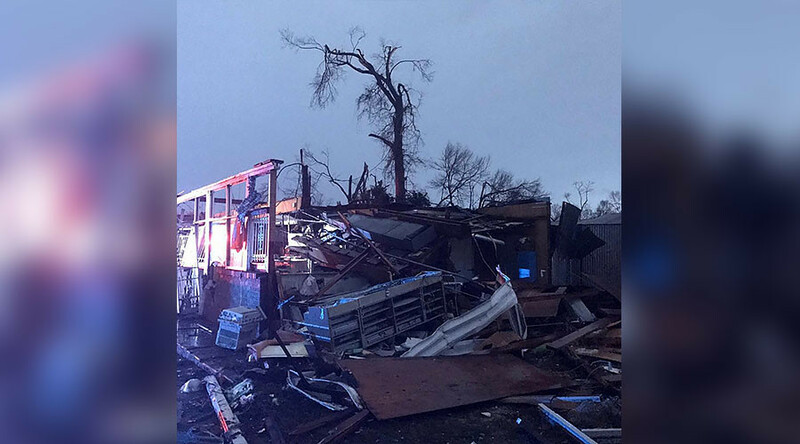 A vicious tornado ripped through Hattiesburg in Mississippi killing at least four people and causing widespread structural damage. The tornado prompted Mayor Johnny DuPree to sign an emergency declaration as dozens of firefighters continue to search for casualties from the devastating storm. Homes and buildings have been decimated, trees uprooted and numerous cars, and even a large truck, were flipped over. The Mississippi Emergency Management Agency (MEMA) said at least four people are known to have died. The tornado caused damage across a three-county area, according to local news outlet the Hattiesburg American, quoting Lee Smithson of MEMA. William Carey University, which is located in Hattiesburg, announced via Twitter that the campus was closed until further notice. The university reported that some of the campus accommodation was damaged while some students had suffered minor injuries. The Hattiesburg Police Department has encouraged people to remain at home and to stay away from affected areas due to gas leaks and fallen power lines. Rescue efforts are being hampered by a lack of resources as a fire station in downtown Hattiesburg was directly hit by the storm. Fallen power lines are also blocking one of their firetrucks and rescue workers had to leave the station on foot in order to help residents in need. There have also been widespread power outages in the area, with Mississippi Power and other utility crews trying to restore services.